The tide of terror that swept America IS HERE! If I lost you on this previous sentence, you either are a) not a Stanley Kubrick fan, b) not a horror genre buff or c) not a Curious George and have seen The Shining once or twice or not at all. And yet, if you recognized the ingenious tagline from one of the film’s posters that features Jack Nicholson’s demented grin, an axe and Shelley Duvall’s petrified, knife-clutching reaction, with Room 237, a documentary about the subversive messages that Kubrick had scattered all over the ominous Overlook Hotel and its setting, you’re in for a treat. 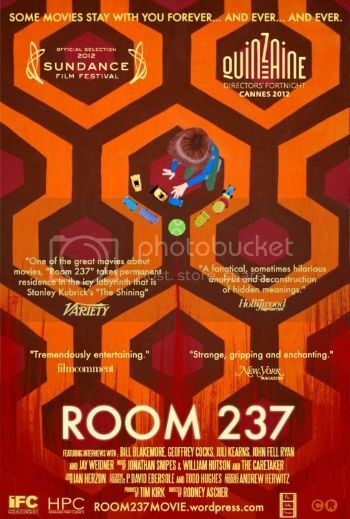 Rodney Ashner’s subjective approach to the morale of Kubrick’s perverted adaptation of Stephen King’s novel by the same name features several testimonies from the people who became so obsessed with the underlying meaning of The Shining that they dedicated their lives to the study of something that – no matter how logical their eventual conclusions were – could never be upgraded from the status of a flawed theory. Their approach is not unlike the one of philosophers to the study of life, and they developed somewhat of a method, or a technique if you will, of how Stanley Kubrick’s subversive masterpiece is meant to be perceived. They keep returning to the crime scene, rehashing already found symbols and still searching for the new ones which could further help put all the pieces together and form more definitive and solid context that would fit the content like a glove. My dissatisfaction with this documentary is purely of a carnivorous nature: my appetites prior to the Room 237 were almost insatiable, so naturally I failed to indulge my hunger. The narrators apply their theories in some details about the indirect connection of the movie’s ground level plot with the holocausts of Native Americans and Jews, but skip the hidden signifi- cance behind the year of that black-and-white photograph from 1921 with which The Shining ends – the same year when Adolf Hitler was appointed Chairman of the Germany Nazi Party! – thus casting aside the more concrete analysis of movie’s historical background. I like the fact that they pointed out the discrepancy between Stephen’s and Stanley’s vision of The Shining, yet, with Mr. Beard, the adapted material is valuable solely as a trigger, a surrogate of the new life that gradually becomes more and more independent from its source; therefore, seeking for a clue on Kubrick’s questions in King’s an- swers, as the majority of the director’s previous projects suggests, often proved to be barren, if not trifle plea. Finally, I was bothered, at times even annoyed, by the incoherent and amateurish discourse from the majority of narrators, who at times sound as crazy and possessed as Jack Torrance; if a madman tells the story full of sound and fury, there’s always the danger that it would not amount to much with their audience, i.e. signify something.